The Longines Column-Wheel Single Push-Piece Chronograph models take their inspiration from the first chronograph wristwatches developed by Longines in 1913. These timepieces housed the 13.33z calibre, the first chronograph movement made by Longines to equip wristwatches. The Longines Column-Wheel Single Push-Piece Chronograph model houses the L788 calibre, a monopusher movement developed by ETA exclusively for Longines and which, like its illustrious predecessor, is equipped with a column-wheel and measures 13¼ lines. All the chronograph functions can be controlled by simply pressing the single push-piece. 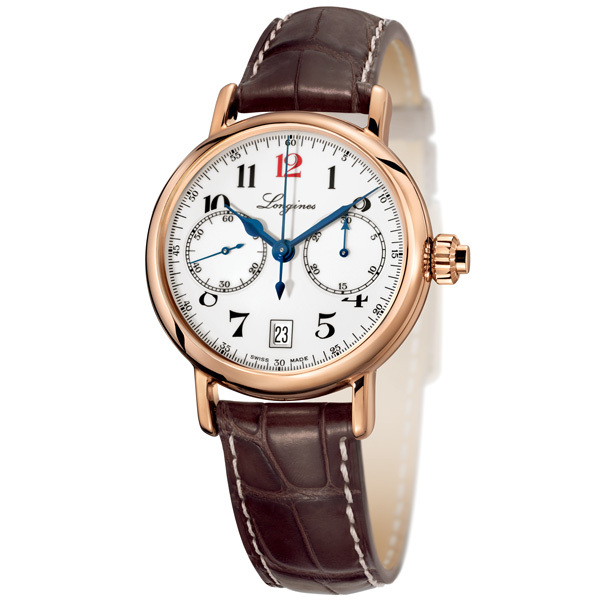 The Longines Column-Wheel Single Push-Piece Chronograph comes in three versions, all with a 40 mm diameter. In each version, the single push-piece inserted into the fluted crown produces a striking aesthetic impact that strongly recalls the original timepieces that inspired them. Their white dials are adorned with painted black numerals and a red "12", in a direct reference to the dials of the period. They are completed by two counters, at 3 and 9 o'clock, together with a date aperture at 6 o'clock. Blued hands harmoniously complete the whole. 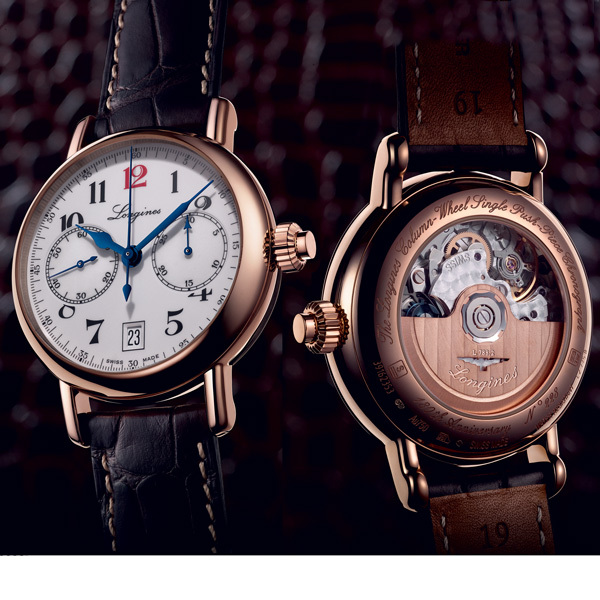 Two versions, one in steel and one in rose gold, feature Arabic numerals, and a third version available in steel displays Roman numerals. 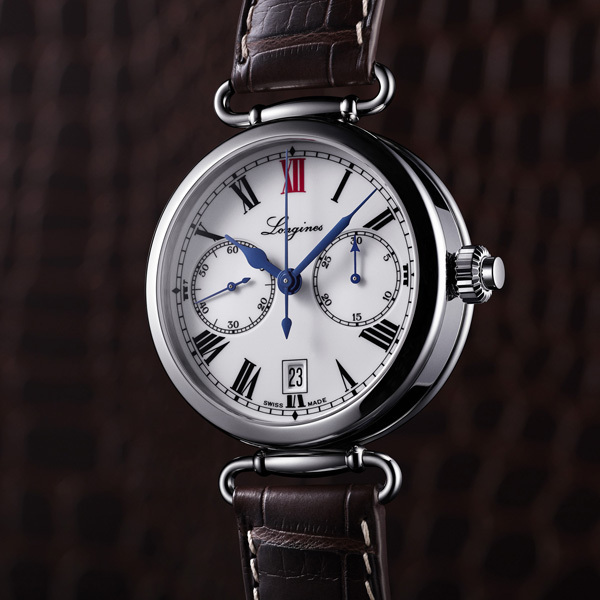 The cases are a particularly interesting feature of The Longines Column-Wheel Single Push-Piece Chronograph. Two of the models have a well-rounded case, available in steel and in rose gold. 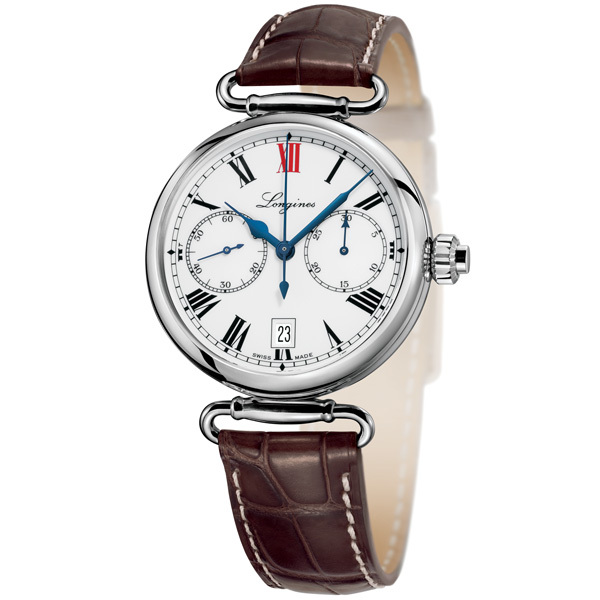 Taking its inspiration from an historic timepiece, the third model in steel is fitted with moving lugs. This version has a thicker case with a more angular profile that gives it a great deal of character. On all three versions, the movement’s blue column wheel can be admired through the transparent sapphire crystal case back. All models of The Longines Column-Wheel Single Push-Piece Chronograph are fitted with a brown alligator strap.